Combine all ingredients in the bowl of a food processor and pulse until smooth (about 1 minute). Having a party? Don’t sweat it with these easy, fast appetizers. I used to stress every single part of every party meal I made. These days though, I strive for zen-ness when I am hosting. And one way I achieve that is by using some super easy appetizers to kick things off. The trick to making Pesto Hummus and Veggie Dippers super fast? Pick up precut veggies at your grocery store. 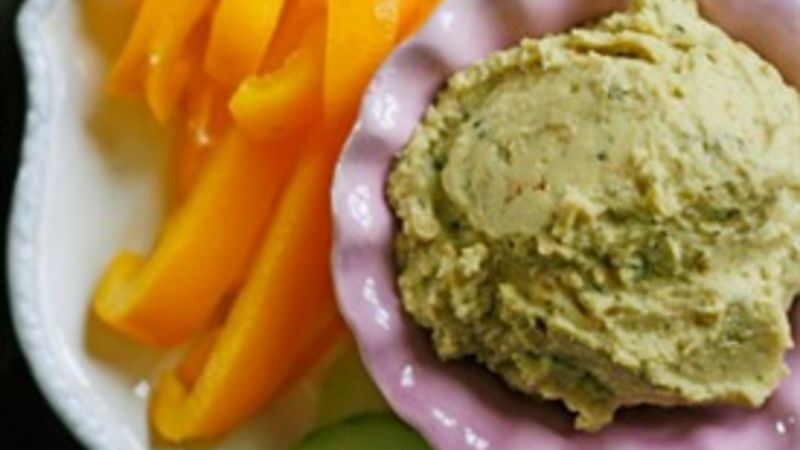 It will take you about 5 minutes to whip up the fabulous Pesto Hummus and arrange the veggies on a platter. Easy as can be. More Fast Apps Here are more super easy, fast and flavorful ideas for your next party or game day!